Over time intervals of hundreds of millions of years, random celestial events pose a global risk to the biosphere, which can result in mass extinctions. These include impacts by comets or asteroids with diameters of 5–10 km (3.1–6.2 mi) or more, and the possibility of a massive stellar explosion, called a supernova, within a 100-light-year radius of the Sun, called a Near-Earth supernova. Other large-scale geological events are more predictable. If the long-term effects of global warming are disregarded, Milankovitch theory predicts that the planet will continue to undergo glacial periods at least until the Quaternary glaciation comes to an end. These periods are caused by eccentricity, axial tilt, and precession of the Earth's orbit. As part of the ongoing supercontinent cycle, plate tectonics will probably result in a supercontinent in 250–350 million years. Some time in the next 1.5–4.5 billion years, the axial tilt of the Earth may begin to undergo chaotic variations, with changes in the axial tilt of up to 90°. During the next four billion years, the luminosity of the Sun will steadily increase, resulting in a rise in the solar radiation reaching the Earth. This will result in a higher rate of weathering of silicate minerals, which will cause a decrease in the level of carbon dioxide in the atmosphere. In about 600 million years from now, the level of CO2 will fall below the level needed to sustain C3 carbon fixation photosynthesis used by trees. Some plants use the C4 carbon fixation method, allowing them to persist at CO2 concentrations as low as 10 parts per million. However, the long-term trend is for plant life to die off altogether. The extinction of plants will be the demise of almost all animal life, since plants are the base of the food chain on Earth. In about one billion years, the solar luminosity will be 10% higher than at present. This will cause the atmosphere to become a "moist greenhouse", resulting in a runaway evaporation of the oceans. As a likely consequence, plate tectonics will come to an end, and with them the entire carbon cycle. Following this event, in about 2−3 billion years, the planet's magnetic dynamo may cease, causing the magnetosphere to decay and leading to an accelerated loss of volatiles from the outer atmosphere. Four billion years from now, the increase in the Earth's surface temperature will cause a runaway greenhouse effect, heating the surface enough to melt it. By that point, all life on the Earth will be extinct. 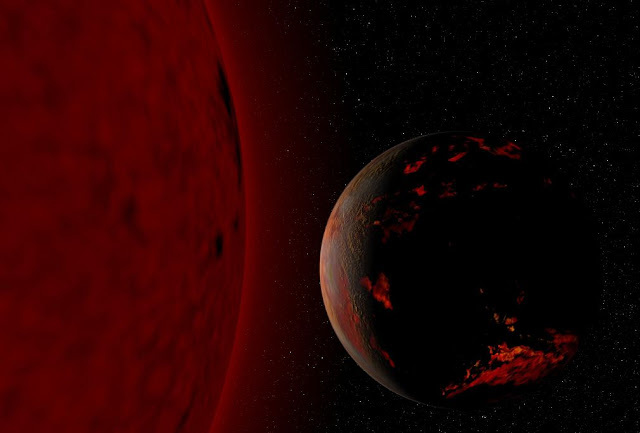 The most probable fate of the planet is absorption by the Sun in about 7.5 billion years, after the star has entered the red giant phase and expanded to cross the planet's current orbit. So let's say lucky us now we won't be there when it happen. The human race if it want to live beyond the earth be eaten by extending red sun. It should drop to oblivion all religions. Put in place a civil code for all. Work all together to put the planet back into sustainable way. Mean less people, and make sure there are all at same rate. A balance yep. Work for the defence of everyone. Then for what we still don't know. But work for what is right. Like management of large object management of evolution of our race into a one race with a lot of different cultures. One currency one way you in dead if not. There is an end to any beginning, so as EARTH. Adaptability may be a key word to face the change. The context, perhaps, looks into two philosophical ideologies. One, a knowledge base consciousness of the drivers of sustainability and the other related to the drivers of sustainability to be self sustainable. In both the cases, involvement of mankind is essential. So, "HOW?" is the question for further discussion. Is the same process in place for Mars? Because of its size has the process time line different? Can we learn anything about Earth from what is happening on Mars? We will all have our own space crafts by then its okay! vii. se não revertermos drasticamente essa tendência, vamos finalmente chegar a um ponto em que a vida na terra será insustentável e entrará em extinção. O ser-humano não consegue SER SER-HUMANO em nada!! Ou não faz por onde?! In accordance with Natural Orders, Our Planet has no option other than to face the final explosion. Then, the End into fragments. After all, NOTHING LASTS FOREVER!